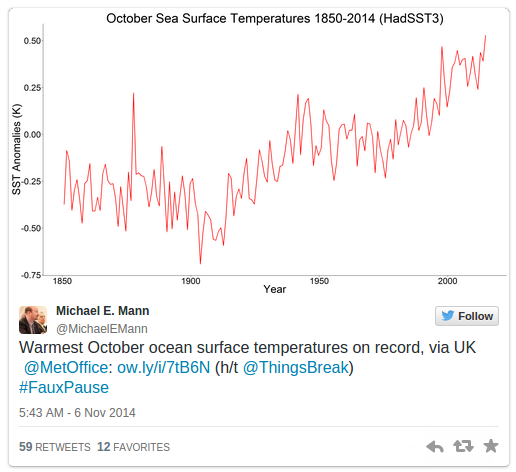 Oceans continue to warm with the latest data from the UK Metoffice HADSST3 showing October 2014 had record warm sea surface temperatures. Over 90 per cent of the heat of global warming is being absorbed by the oceans. 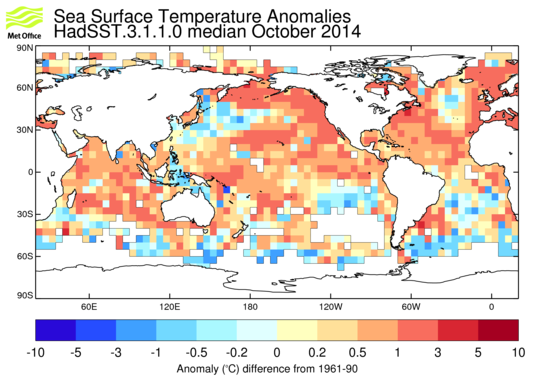 Here is a map of ocean temperature anomalies for October 2014 from the Met Office website. When considering both sea surface temperatures, acidity (due to ocean acidification) and salinity the world's oceans are already outside their historical variability, with a climate departure estimated as 2008 by Mora et al (2013). In January I reported that Ocean Heat Content to 2000m continues warming. Sea surface temperatures remain very high in the Pacific, one of the signs of the development of El Nino, but the change in trade winds and coupling with changes in atmospheric conditions hasn't happened yet. The Australian Bureau of Meterology (BOM), as of 5th November, says an El Niño threshold is close but still classified as neutral according to the mean model ensemble prediction. Some ocean areas in the Caribbean, western and south-central Pacific Ocean, and Indian Ocean experienced their warmest October temperature on record. ENSO-neutral (neither El Niño nor La Niña) conditions persisted across much of the tropical Pacific Ocean during October. According to NOAA's Climate Prediction Center, neutral conditions are favored through the Northern Hemisphere spring 2014. Averaged globally, the global ocean temperature was 0.50°C (0.90°F) above the 20th century average, ranking as the eighth warmest October on record. The uptake of heat into the world's oceans effects atmospheric surface temperatures. It is one explanation for the Hiatus in atmospheric temperatures over the last 18 years. Scientists have argued that Atmospheric surface warming stalled by strong Trade winds driving heat into Pacific ocean and that Warming may spike when Pacific Decadal Oscillation moves to a positive phase. What we can be certain of is that there has been no slowing in global warming once we consider the role of the oceans in regulating surface temperatures. NOAA National Climatic Data Center, State of the Climate: Global Analysis for October 2013, published online November 2013, retrieved on November 6, 2014 from http://www.ncdc.noaa.gov/sotc/global/2013/10.